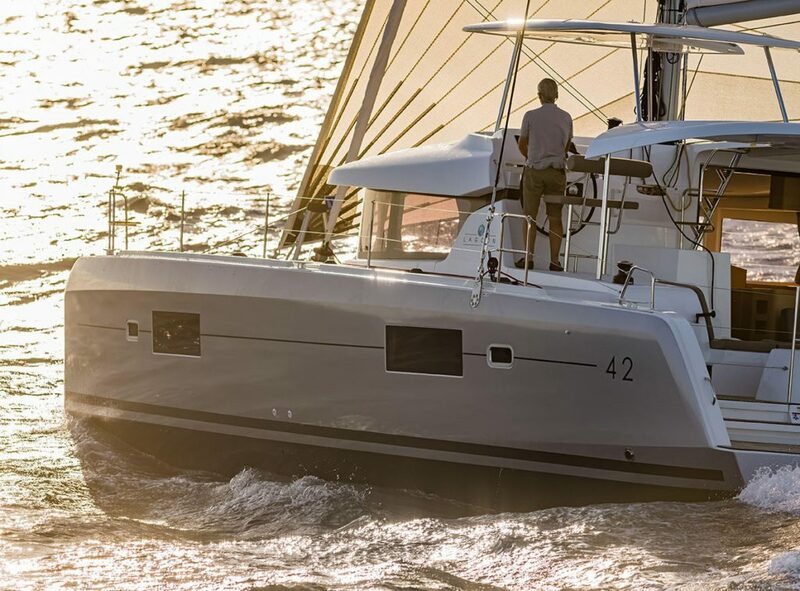 Creative styling, strong performance and beautifully finished. 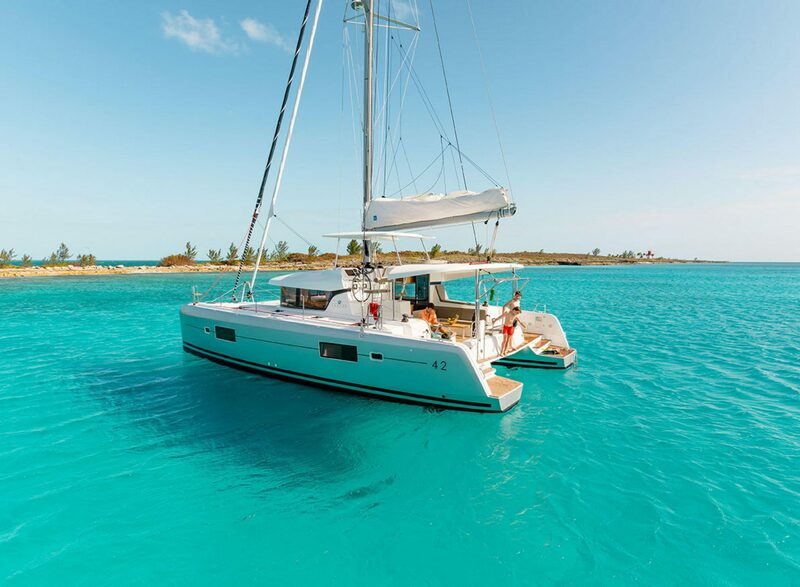 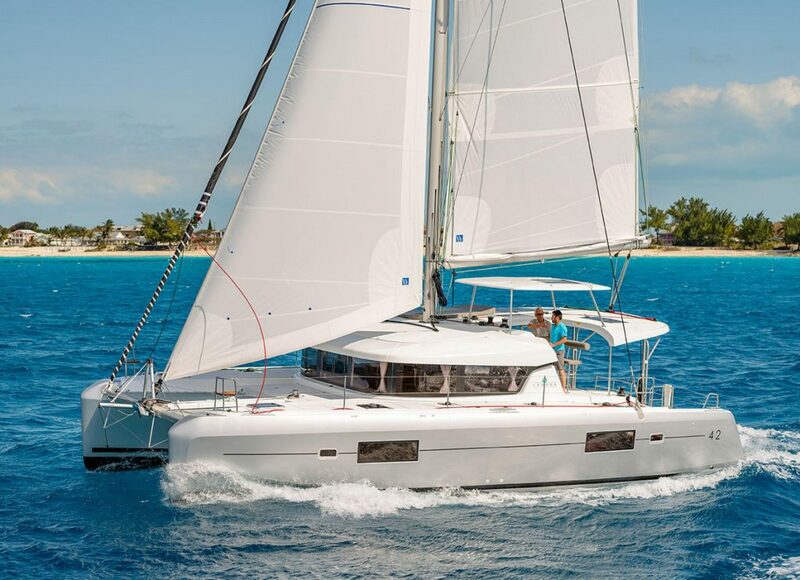 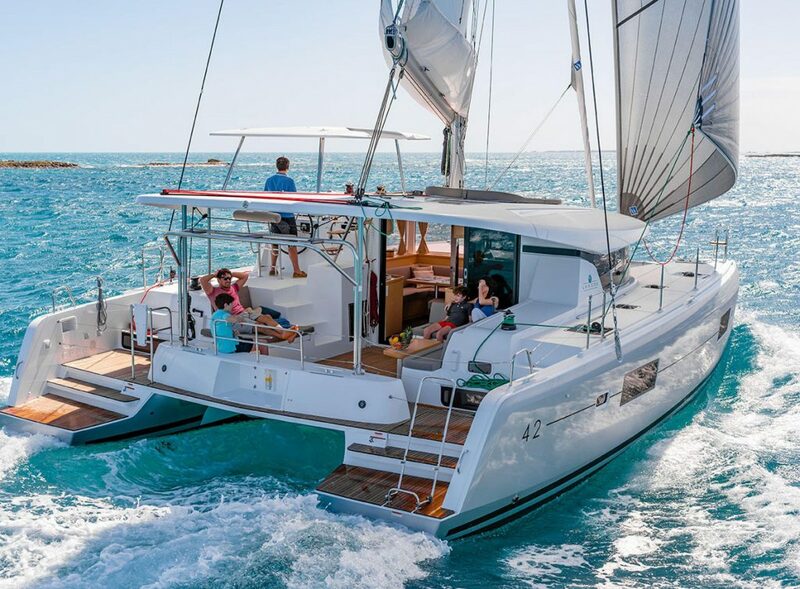 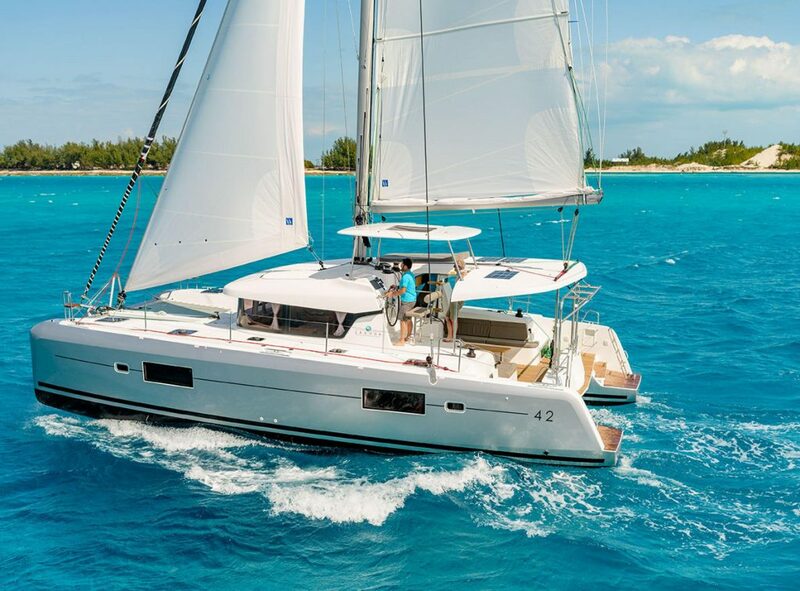 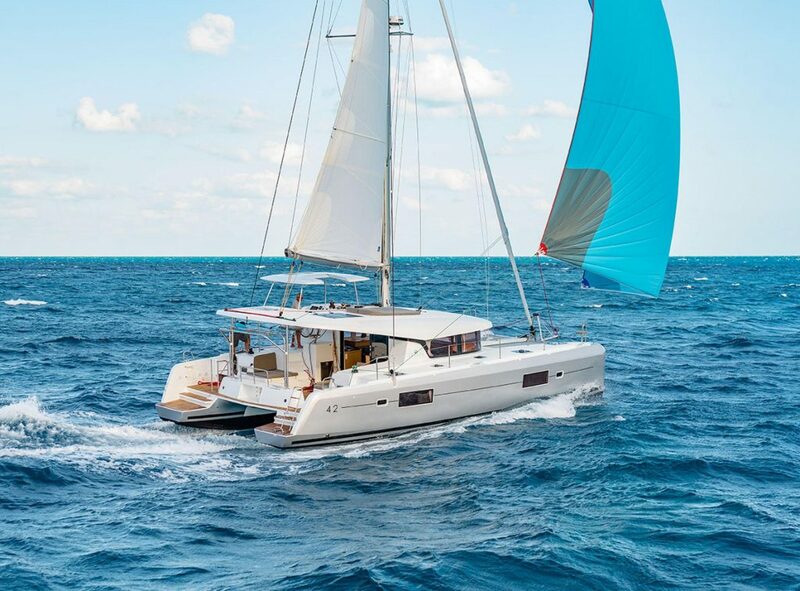 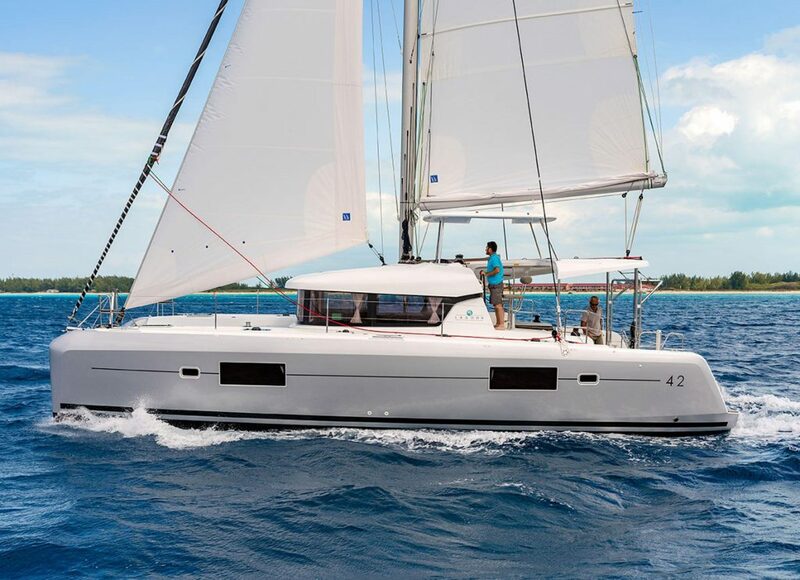 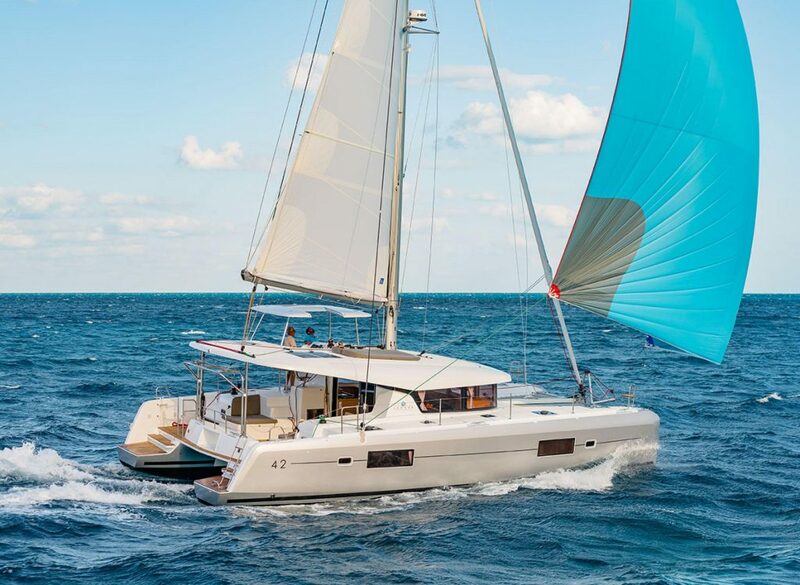 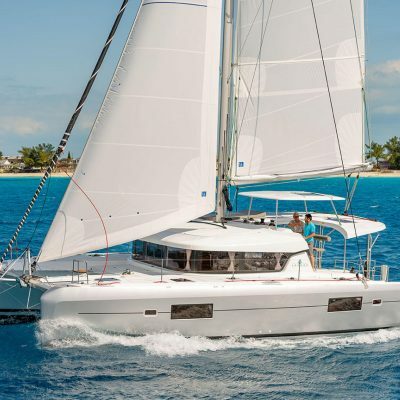 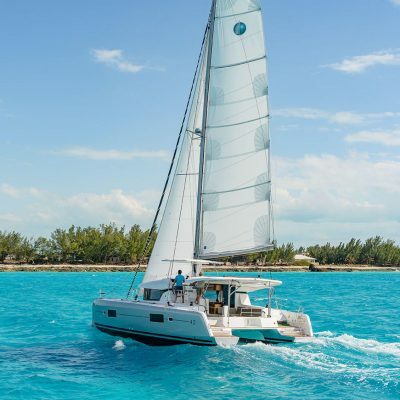 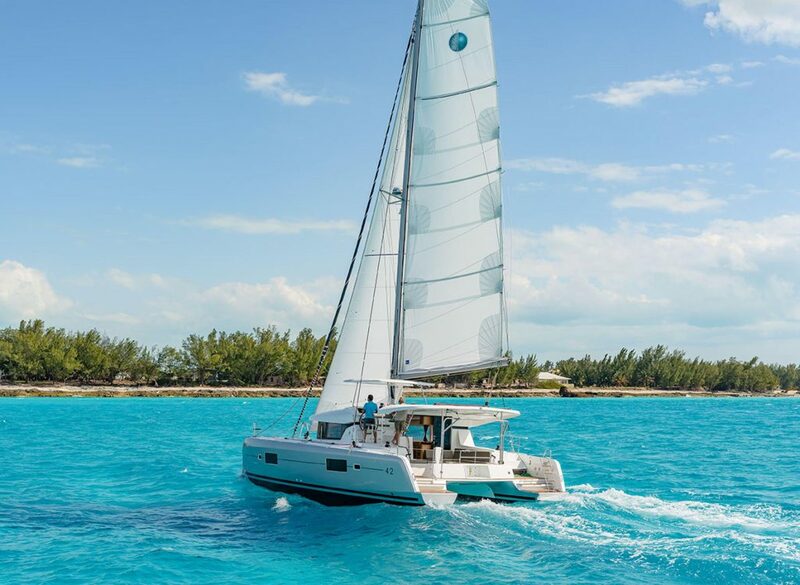 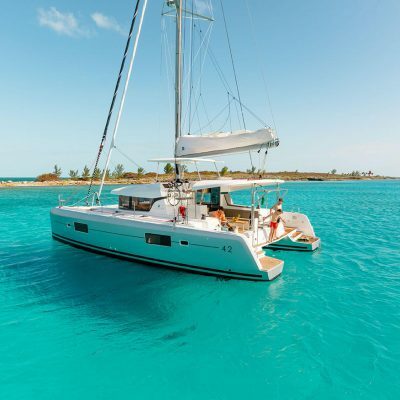 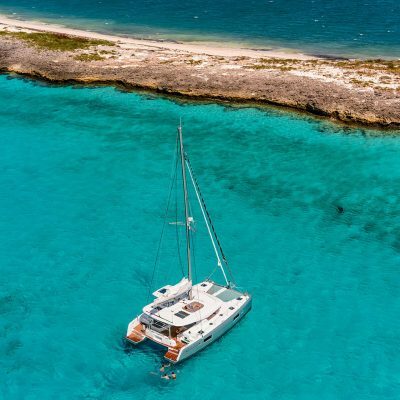 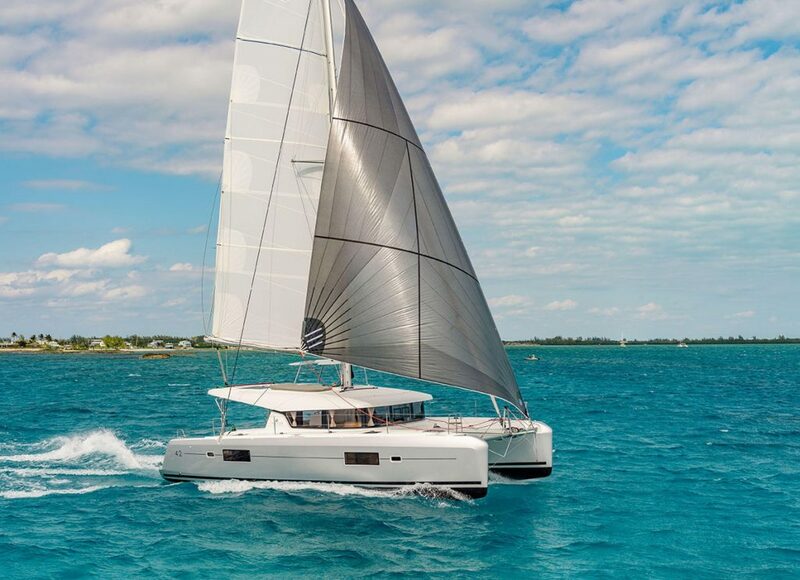 Well constructed and beautifully finished the purposeful Lagoon 42 has all the elements of a great cruising catamaran. 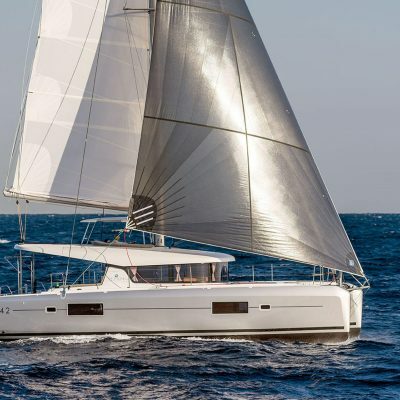 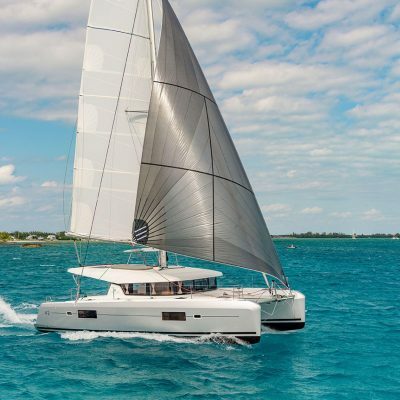 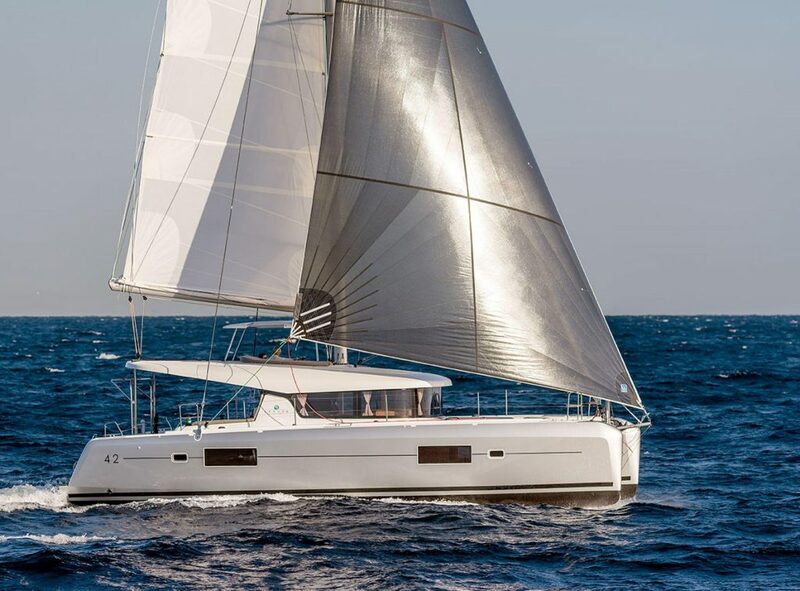 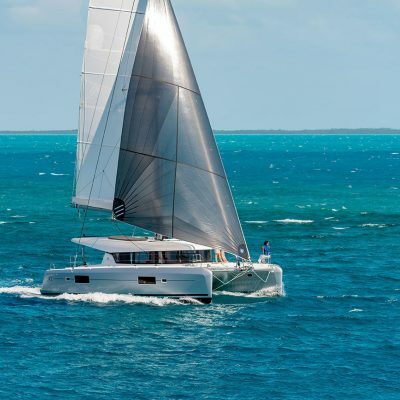 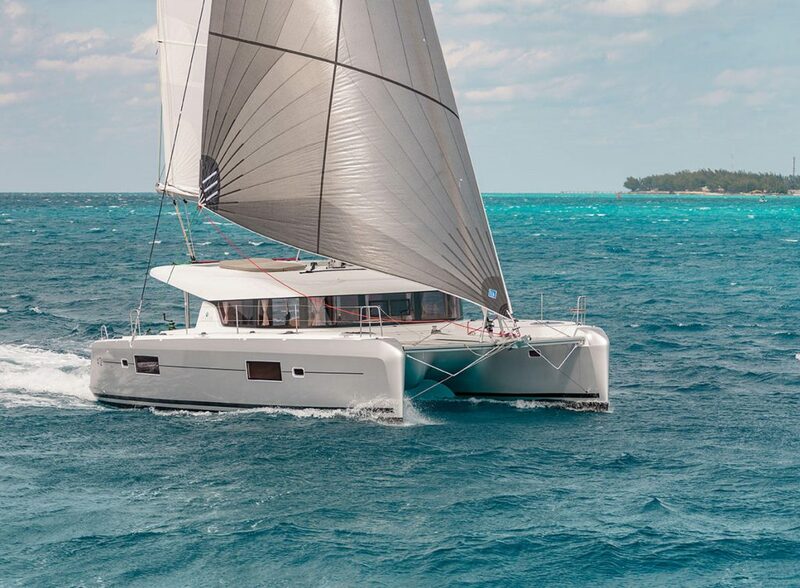 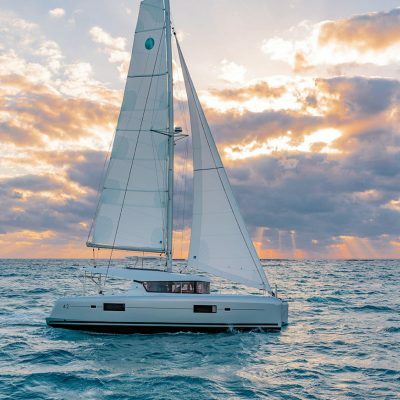 In 2017 she won Sail Magazines Best Multihull between 41 and 50 feet and in the same year scooped Cruising World’s Boat of the Year in the multihull 41-50 feet category. 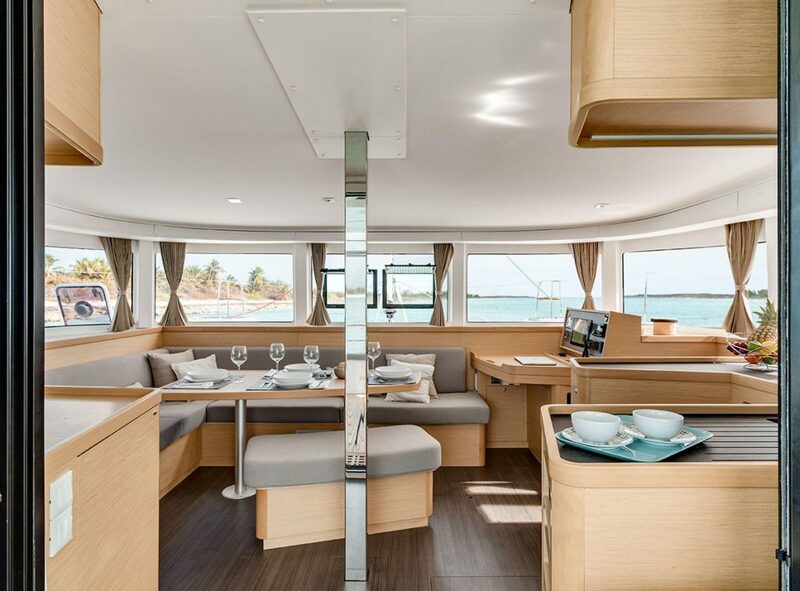 The open plan saloon and spacious cockpit combined with creative styling makes her feel bigger than her 42 feet. 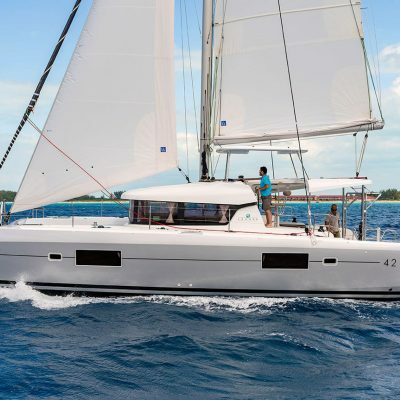 Her balanced rig, decent sailing performance and great maneuverability under power are a winning combination. 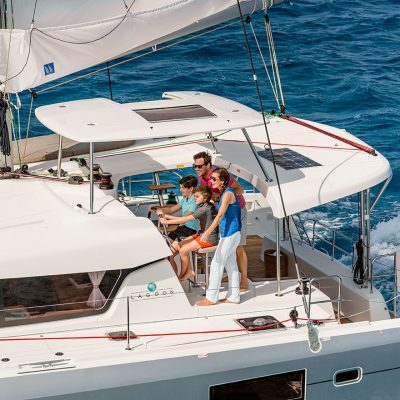 The raised helm position and great deck layout make communication and movement around the boat a breeze. 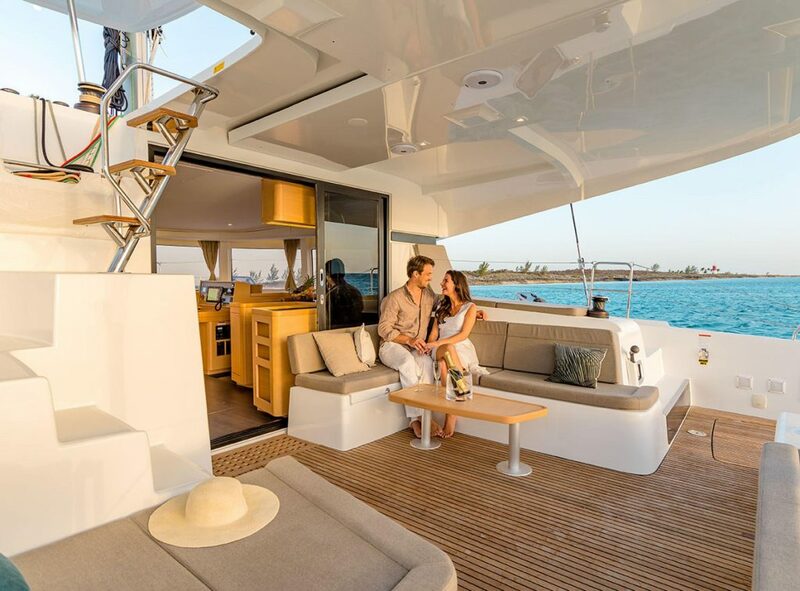 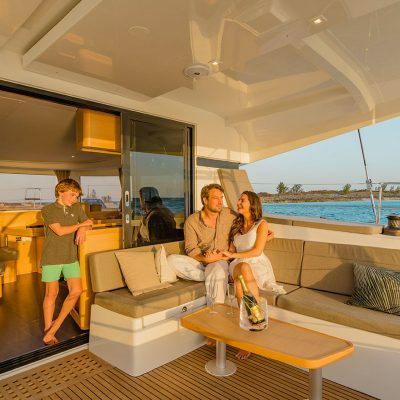 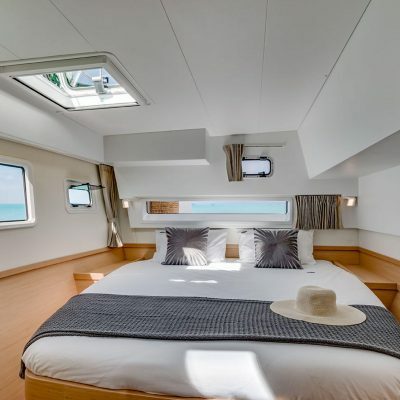 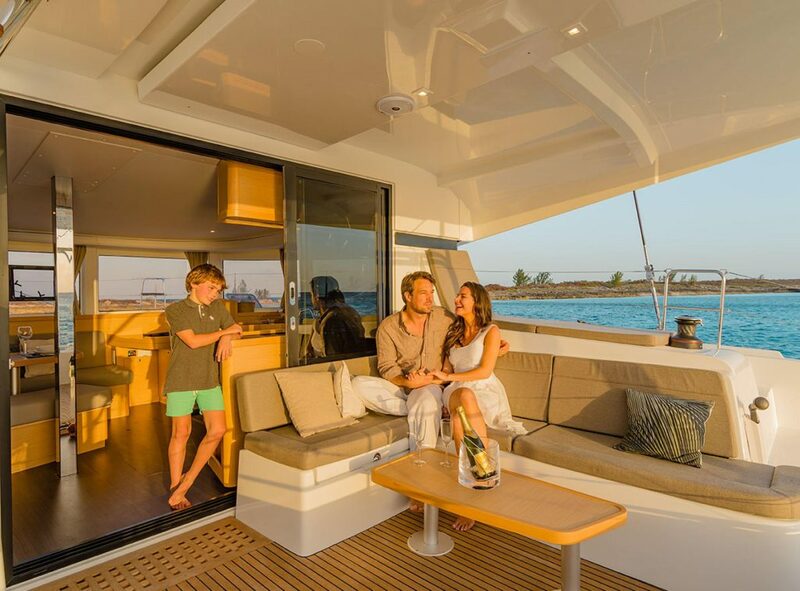 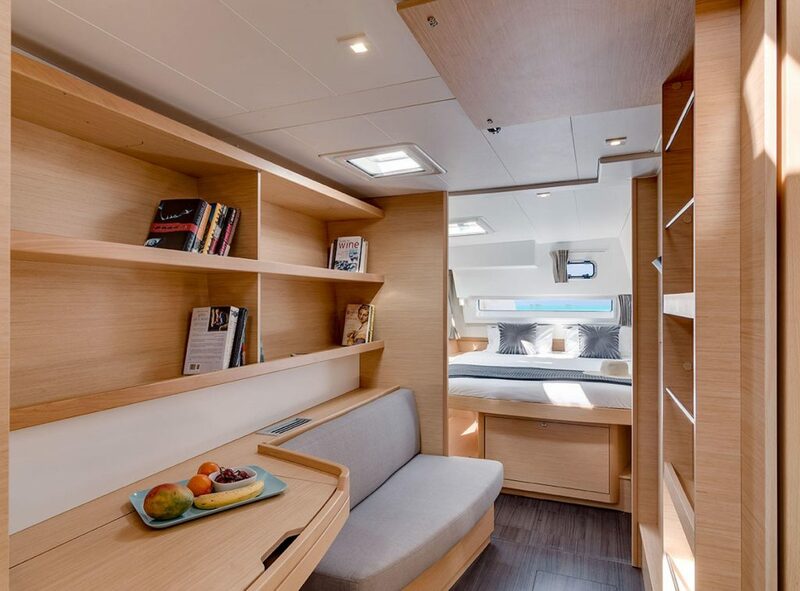 Italian designed interior provides elegance and functionality for comfortable living below decks. 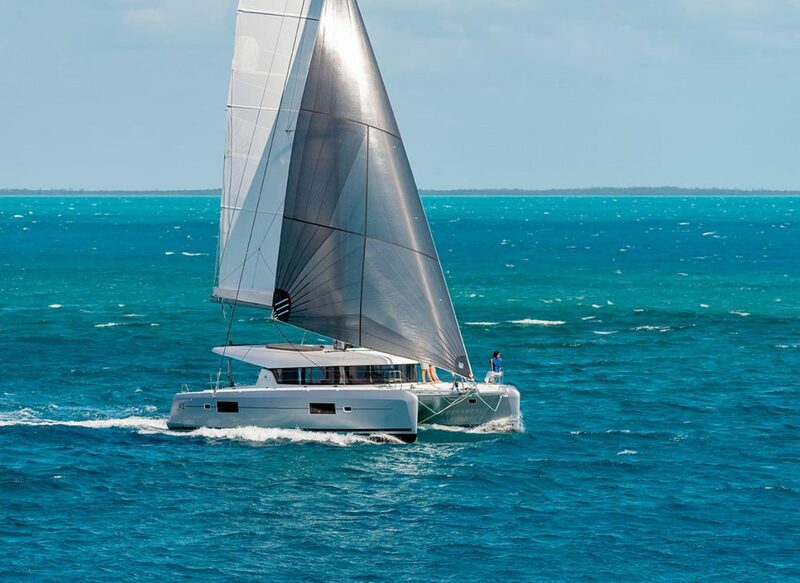 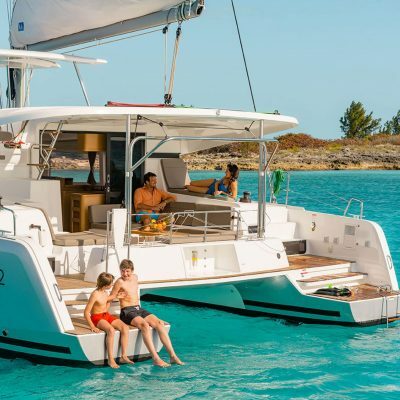 Please scroll down to read more about this fabulous catamaran. 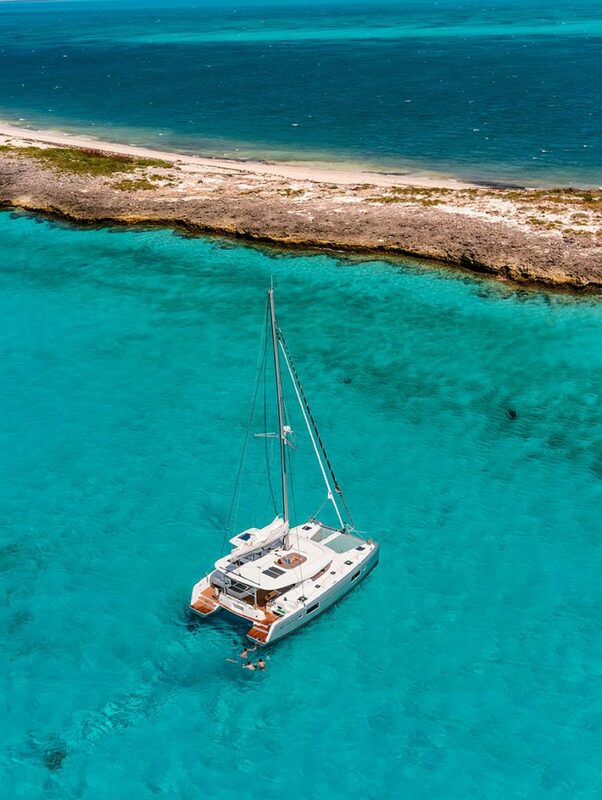 Moving around the Lagoon 42 is easy and safe. 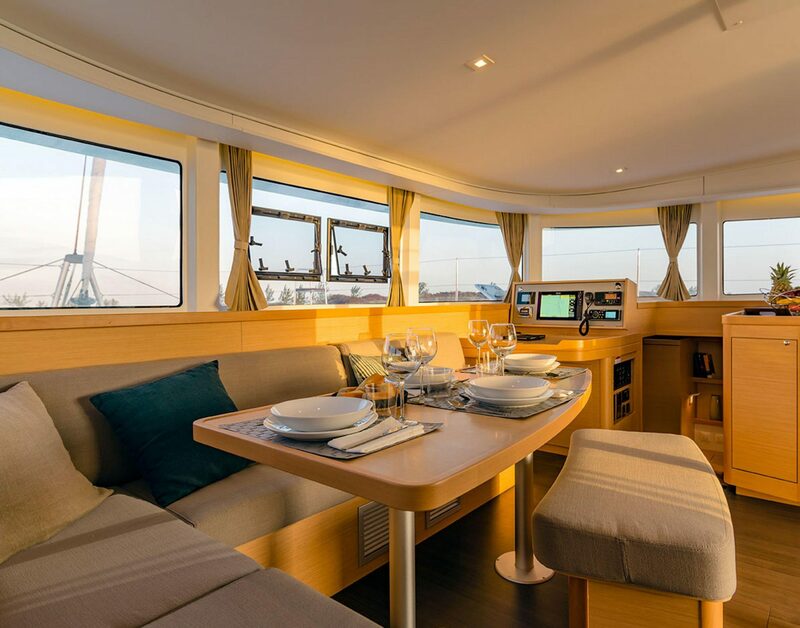 The decks are wide with flush hatches and there are built-in handholds around the coach-roof. 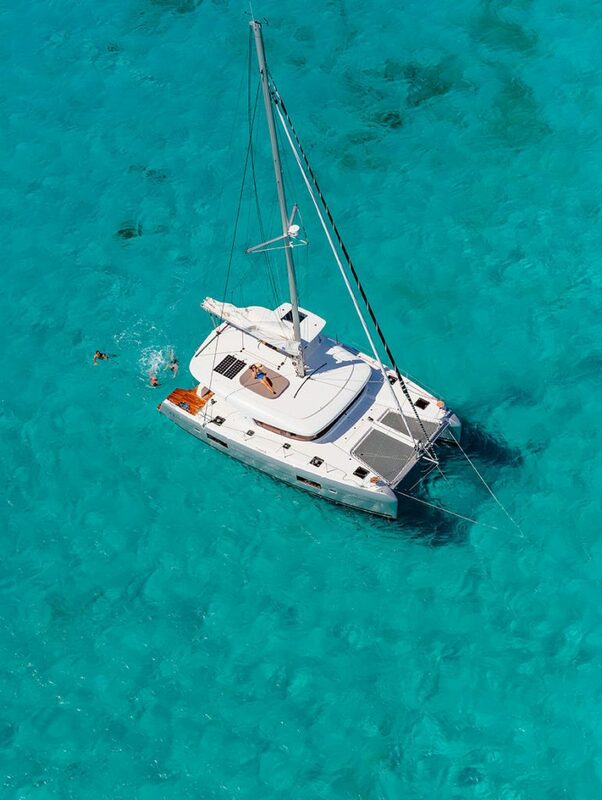 The sugar scoops are cut away inboard and make a transfer to and from the dinghy much easier. 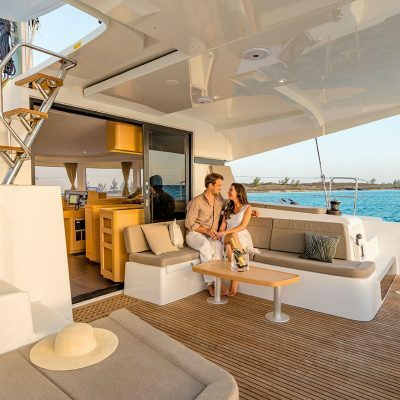 Up forward there is easy transfer across the trampoline and at the helm-station, you have a walkway behind the helm seat that makes cockpit to deck movement a breeze. 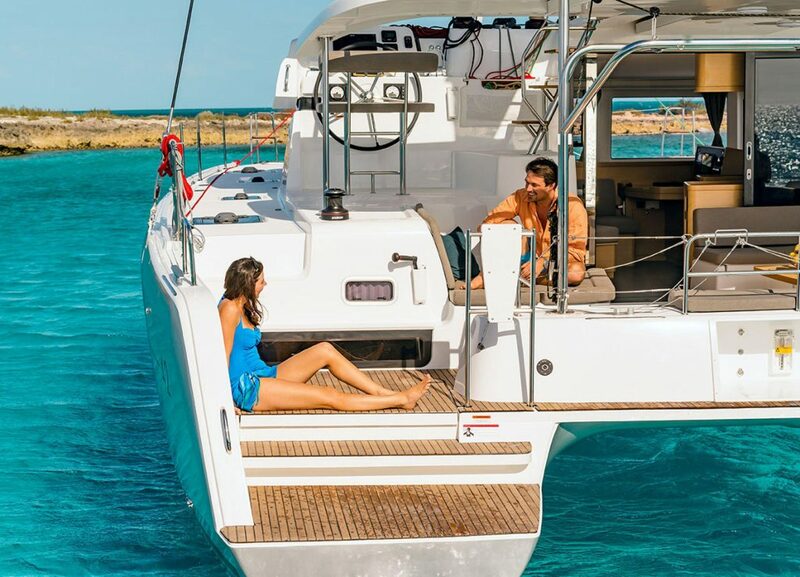 At the helm, all the Yanmar engine controls and the B&G instrumentation are ergonomically laid out and the sail controls easily accessible. 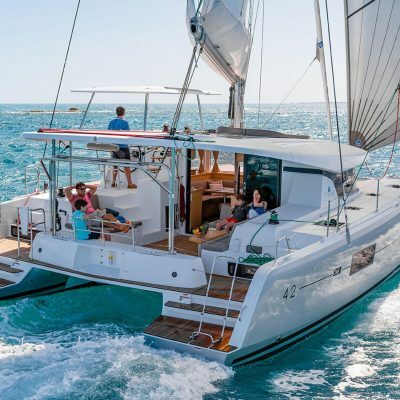 There is plenty of room for two people and the design makes sailing this boat shorthanded a joy. 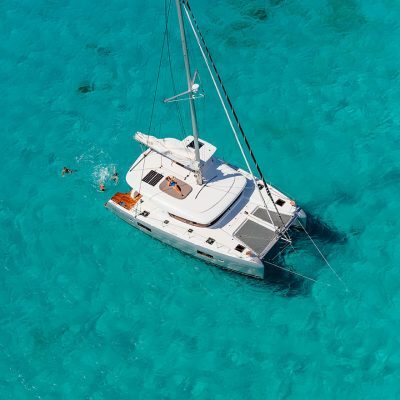 The power winch on the coach roof is perfect for hoisting the mainsail and also comes in useful when operating the dinghy davit. 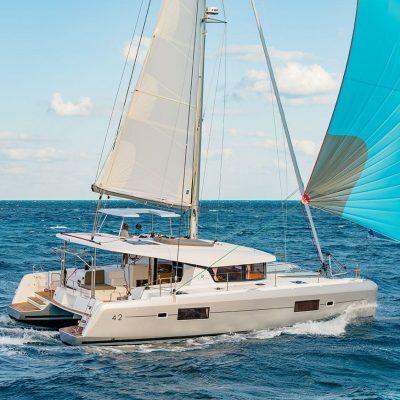 Access up to the boom is via a couple of steps, the boom itself is low and makes stowing the mainsail and zipping the stack-pack straightforward. 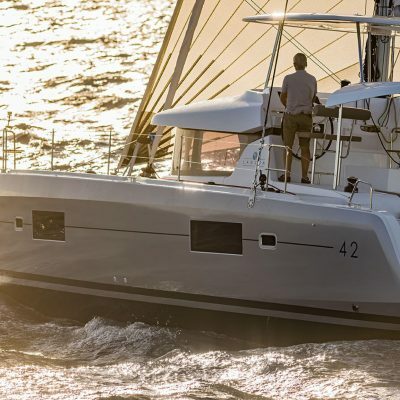 Having the raised helm neatly integrated with the cockpit makes communication up and down easy, and also means the helm has great visibility: forward and importantly aft, especially useful if docking stern to. 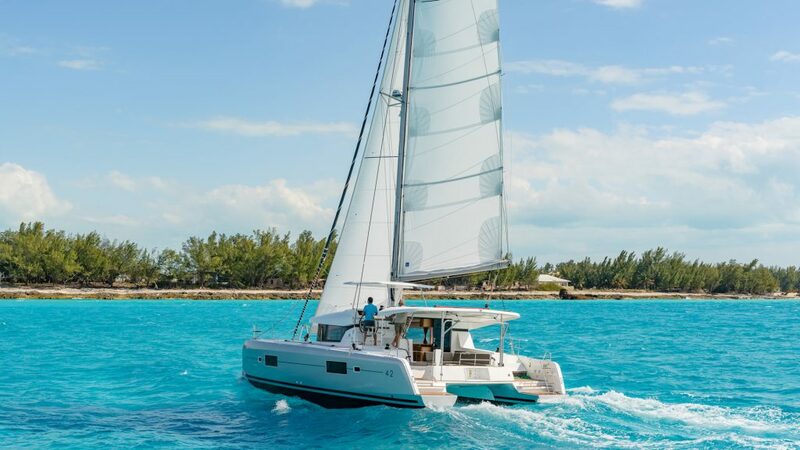 The composite bimini has sliding hatches, so seeing aloft and setting sails is simple. 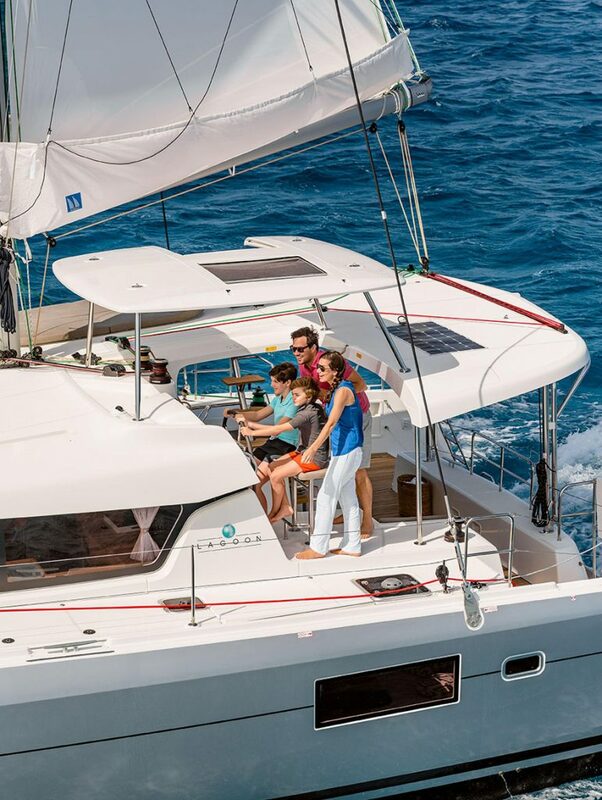 Roll-down clear screens are available for protection should the weather not be cooperative. 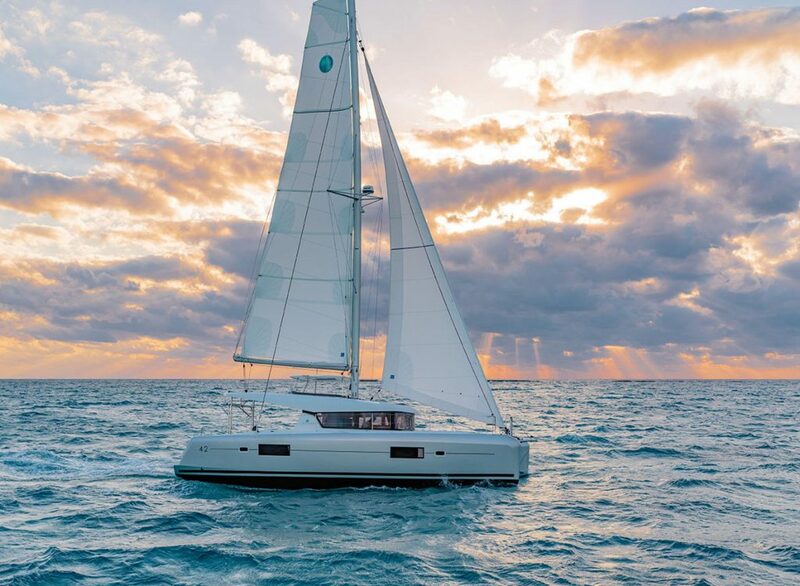 Under sail, the boat feels balanced. 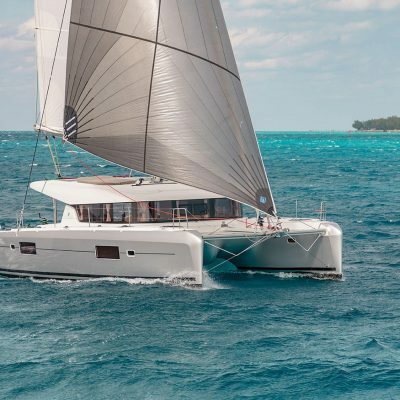 The sixty-seven foot mast is set slightly further aft than on previous models, this reduces pitching but also allows for a self-tacking genoa set on a curved genoa track. 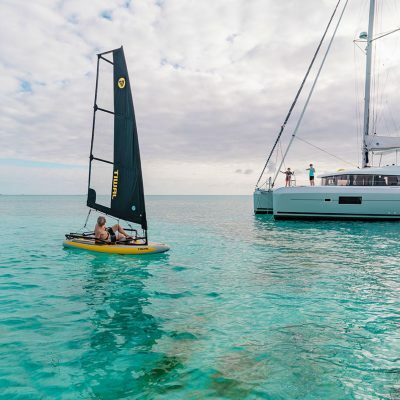 The mainsail, set on a shorter boom is just under 600 square feet, so slightly smaller than you might expect but is easy to handle, and balanced by the larger than usual foresail. 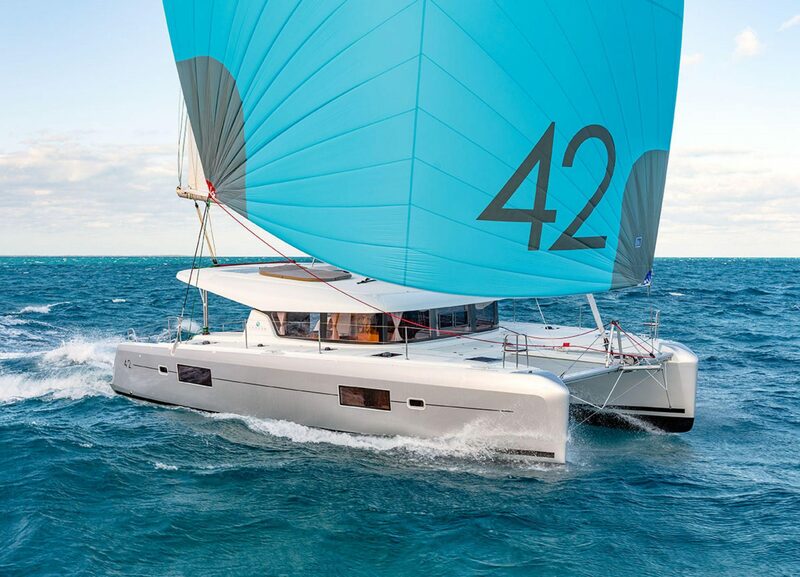 The two sails work well together and off-wind delivered over 8 knots average in 17-19 knots true in a slight chop. 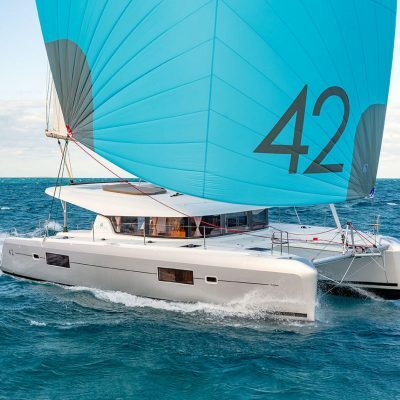 With a gennaker or spinnaker, the Lagoon 42 will deliver mid-teens performance in the right conditions. 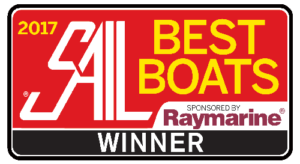 Under power, the standard Yanmar 45HP engines work well, and there is an upgrade to 57HP option if desired. 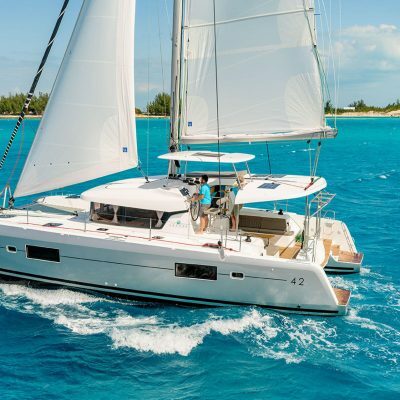 You can expect 8 knots at 2600rpm in fairly smooth water. 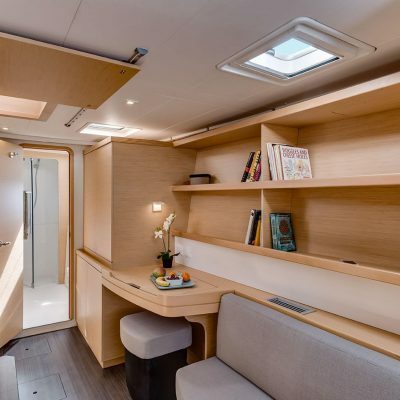 The cockpit is spacious and has an option for an additional fridge. 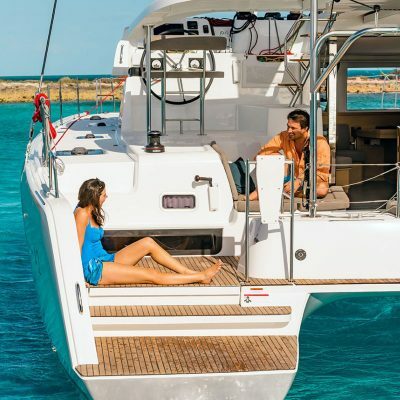 At the transom, there is a new davit design for Lagoon that is capable of lifting up to 440lbs. 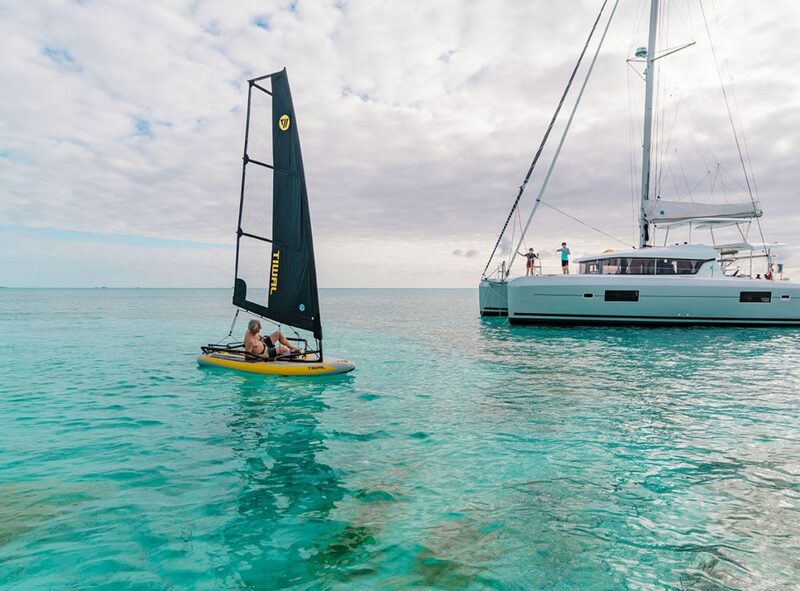 That’s easily enough for an average 11ft dinghy and a 15HP outboard. 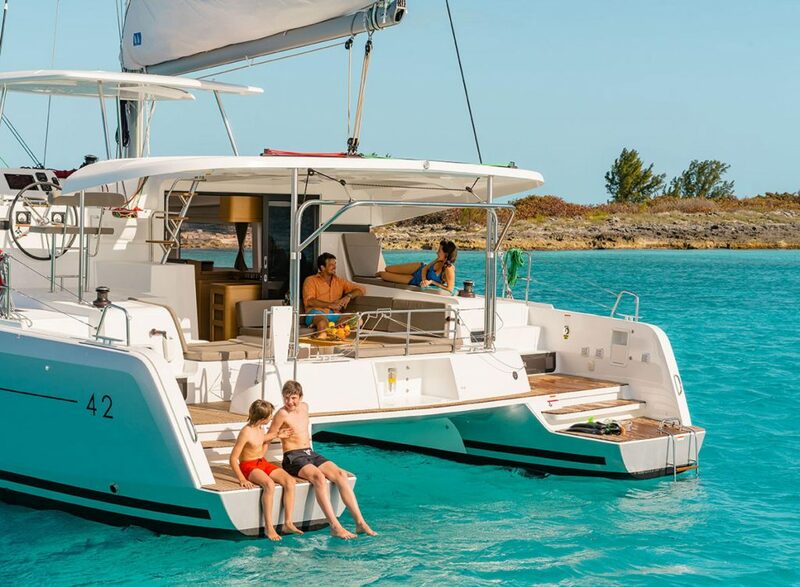 The gullwing bridge-deck offers greater comfort in bigger seas and with the anchor running over the forward crossbeam, anchoring and the attaching the bridle is easy. 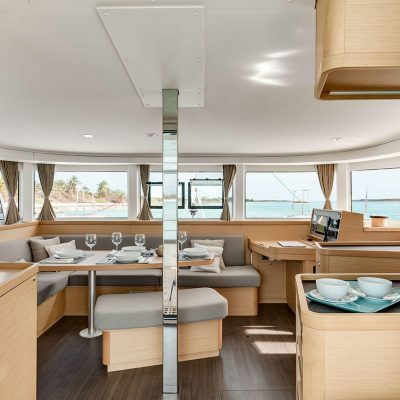 The sliding door to the saloon opens wide and connects the cockpit with the saloon on one level. 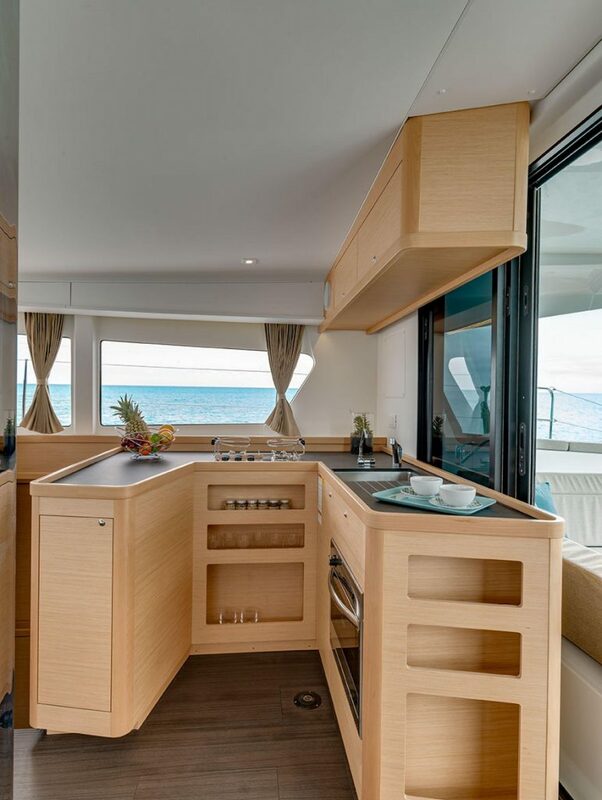 The U shaped galley has a three burner stove, extensive workspace, and storage. 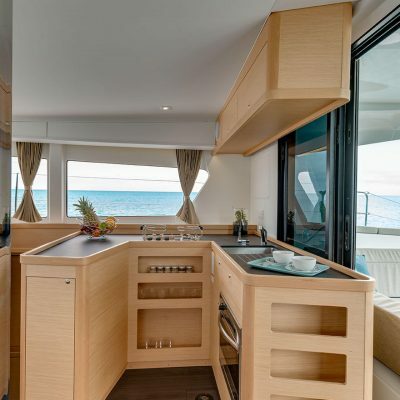 Fridge, freezer, and microwave are all neatly integrated. 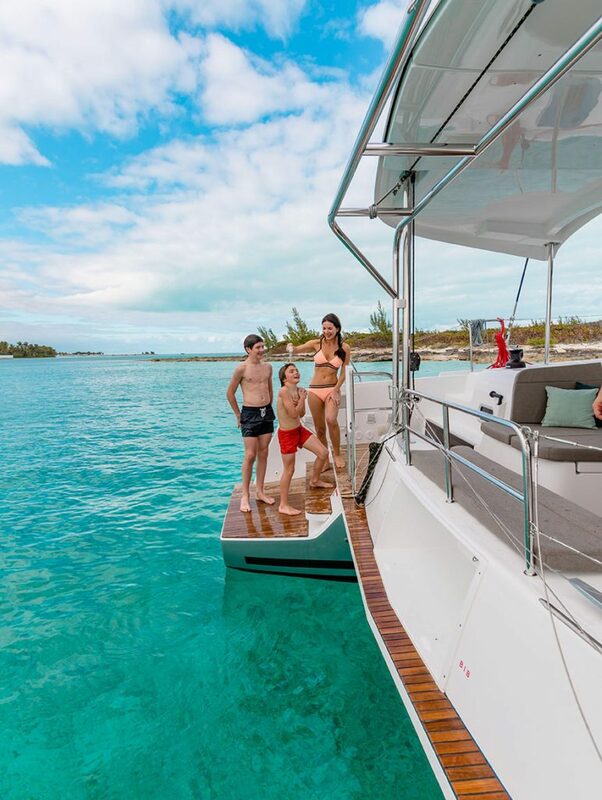 The central chrome covered mast support provides a great hand-hold when on the move, but also allows for a large forward lounge area with plenty of seating. 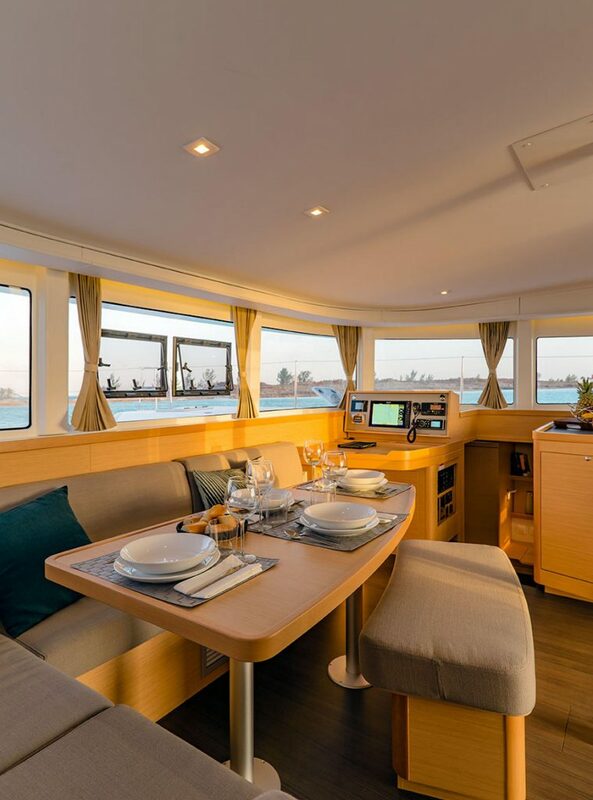 The high vertical saloon windows provide great light and panoramic views and plenty of headroom. 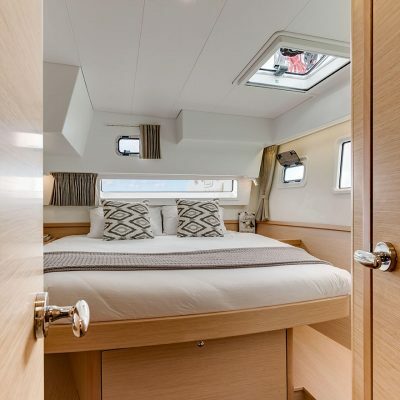 Two neat opening windows forward give generous ventilation at anchor. 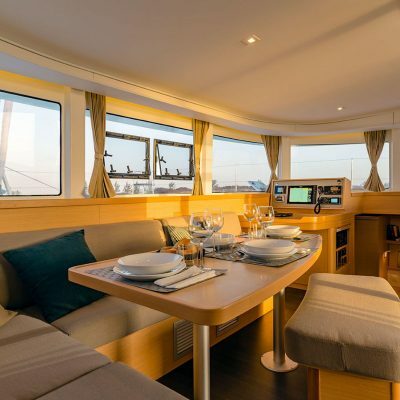 It is a very enjoyable and comfortable living space. 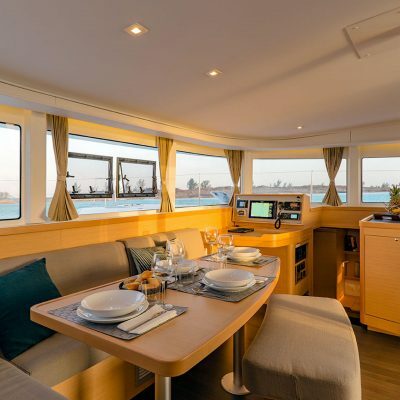 In the hulls, the Italian Nauta Design delivers elegance and functionality, be it in the four-cabin or three-cabin version. 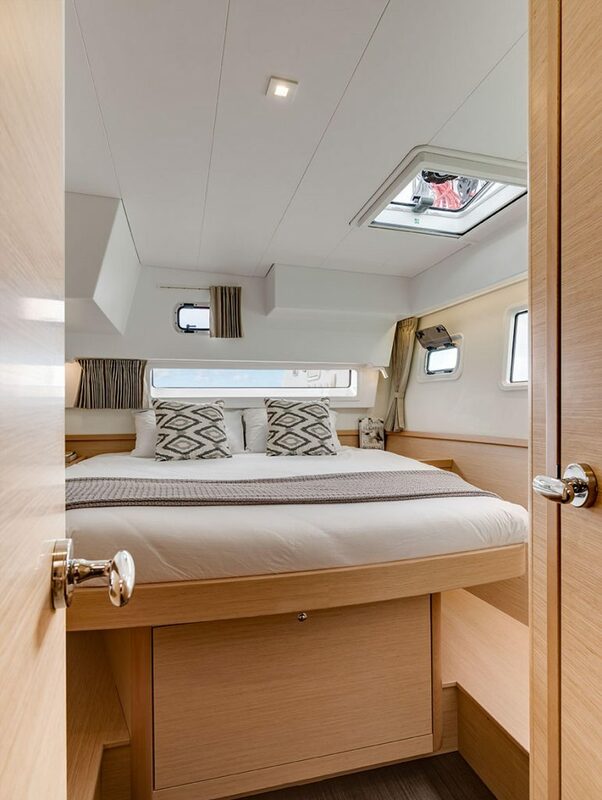 Large fixed hull windows provide wonderful light and opening port-lights add ventilation. 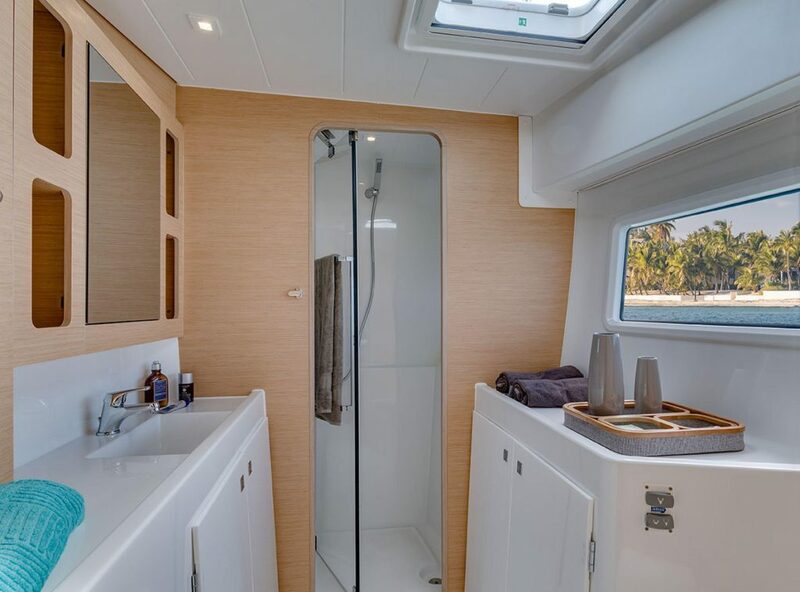 In the four cabin version, the aft cabins have double island berths and the bathrooms offer saltwater electric heads and separate shower area. 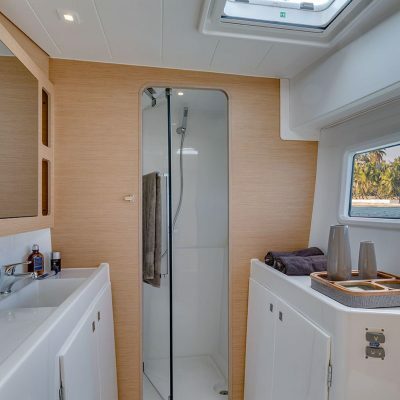 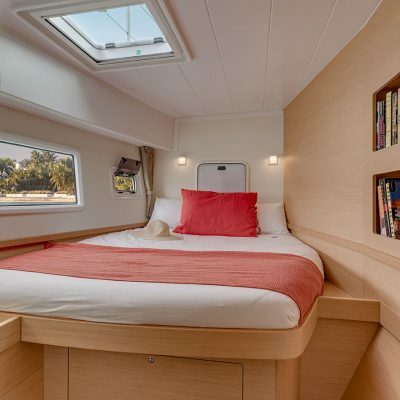 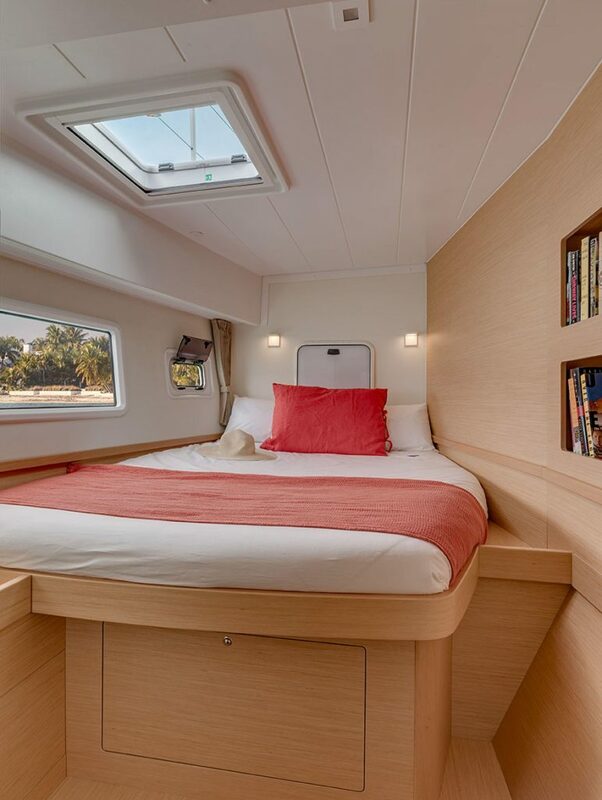 The forward berths are doubles with neat side access and have their own combined head/shower. 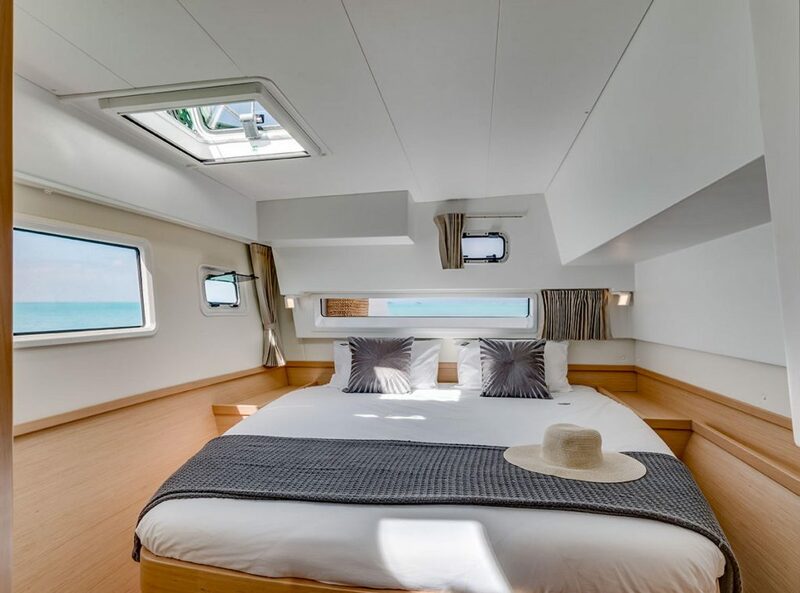 In the three cabin version the master suite, with separate head and shower forward and lounge area mid-ships, is to starboard. 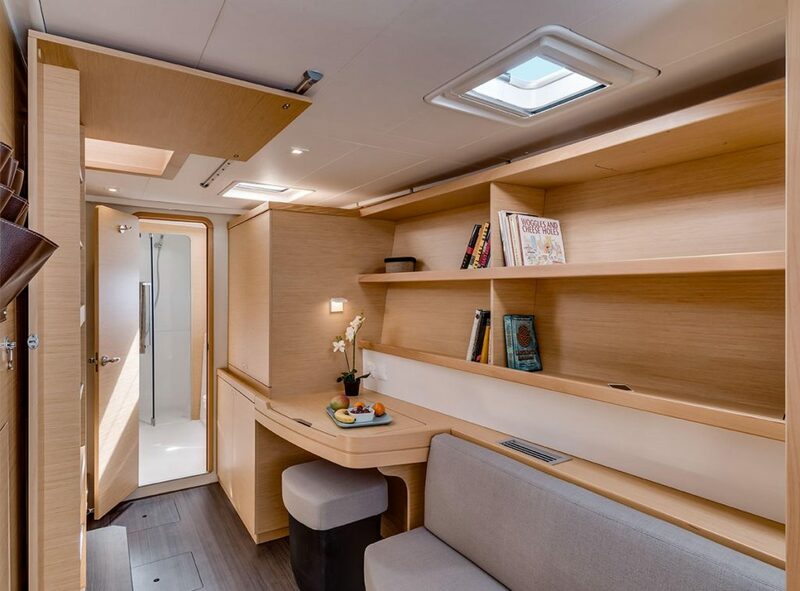 Each cabin has AC plugs and optional USB charging points. Both versions offer extensive storage throughout. 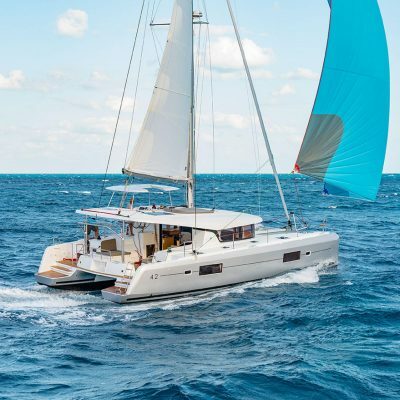 The deck and hull are constructed using infusion and vacuum injection; a process which provides high quality composite, optimizes weight saving without compromising strength, and is also better for the environment. 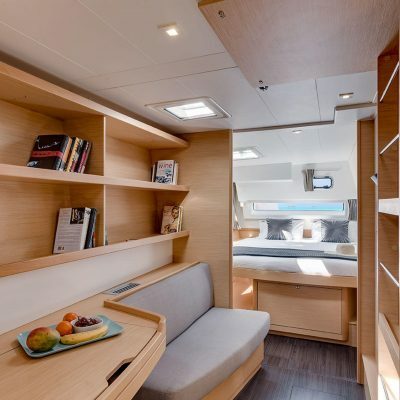 The interior furniture is made of robust resin infused reconstituted wood: Alpi®, allowing a wide range of shapes with high quality, long lasting handcrafted finishes, as-well as contributing to environmental sustainability.